Some state agencies are balancing their budgets by requiring employees to take unpaid leave or furloughs. Employees are asking: “Is ITD planning on employee furloughs as well?” No mandatory employee furloughs have been required for ITD employees at this time and none are planned. However, in these uncertain economic times, there are no absolutes. 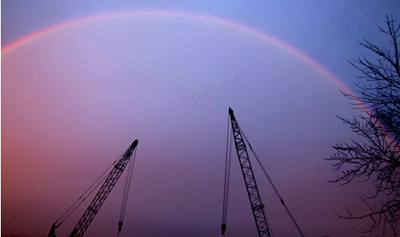 A rainbow framed two highway construction cranes following a storm in Meridian last week. This photo, taken at ITD's Ten Mile Interchange project, was provided by Rene Becar who lives near the construction site. Gov. C.L. “Butch” Otter welcomed Legislators back to the refurbished Capitol and the opening of the decade’s first legislative session Monday. But his combined State of the State and budget address also included a monumental challenge. Gov. Otter emphasized the need to cut an additional $40 million from state spending before the end of this fiscal year and the need to carry that austere approach into the next fiscal year – without raising taxes. The U.S. House of Representatives recently passed a new stimulus bill that would provide additional funds for transportation projects – if it gains Senate approval and the President’s signature. The Senate is expected to consider the legislation soon. ITD staff will present a report and possible options to the Idaho Transportation Bard when it assembles for the first monthly business meeting of the year Thursday in Boise. Early this month, Mary Harker (HR manager) and Forrest Anderson (Cyber Security Office) visited with District 3 supervisors and employees about Internet and e-mail usage at ITD. The central point was adherence to policy - as defined by management, ITRMC (Information Technology Resource Management Council) and the Idaho Governor’s directive – that reinforced using computers, Internet and e-mail appropriately. We have received the following information from The Office of the CIO. Most people are aware that the internet is rife with scams and fake information, when they are preparing to donate to a charity after a disaster or emergency, they often aren't thinking about the criminals who are poised to take their money. The winter nights are long and can be very cold. Are you prepared to face them without your home’s modern amenities? The below zero temperatures experienced late last year serve as a reminder that preparedness is not just for major disasters. What would you have done if your utilities had failed during one of those sub-zero nights? In May 2008, ITD purchased the statewide license for Rideshare, a free online ride-matching service. The program allows individuals to register their commute information and search for other people to share their commute via car or vanpool. Rideshare also offers a matching service for people who wish to share the ride to listed sporting events, concerts, exhibits and tourist areas. I am excited about the opportunity to lead the Idaho Transportation Department – a department that accomplishes great things. I come to you from Michigan where I have 30 years of experience in the transportation field. I have been employed in district offices and headquarters, with experience in multiple transportation modes. Being involved in development, construction, maintenance, operations and numerous administrative functions, it is likely I have at one time or another during my career touched an area that you work in. The Idaho Transportation Board Wednesday (Jan. 6) revised its recommendation for bonding authority next year to finance expansion of the state's highways from $45 million to $26 million because of savings in the program. The bond request is part of the GARVEE Transportation Program approved by the Idaho Legislature. Bridges are versatile. They carry a variety of loads – cars, commercial trucks, recreational vehicles, motorcycles, bicycles, pedestrians. And sheep. Even before it has been cleared to accommodate vehicles, the new bridge over the Snake River at Weiser was pressed into service this week. The 2010 Excellence in Transportation Awards program is accepting applications for honors in three personnel categories and four project categories. Applications must be submitted by 4 p.m. March 24. Three awards will be given in the personnel category: ITD Engineer of the Year, ITD Professional of the Year and ITD Career Achievement. Project awards include: construction, environmental stewardship, maintenance and operations, public participation and transportation planning. It was 1952. Harry S. Truman was President of the United States. The transistor radio, polio vaccine and the “pill” were introduced. Bread cost 16 cents. And seven employees of the Idaho Department of Highways pooled their resources (a total of $35) to form a credit union primarily for employees in Idaho’s transportation sector. Idahy was born. Note: The following is a guest opinion printed in the Idaho Press Tribune. Writer Tyler Kent is the 12-year-old son of Sharron Svir who works in Financial Services at Headquarters. There is a lot of this recycling stuff going around in Idaho lately. People have been advertising how good it is to have an eco-friendly car that runs on electricity. People just think that it is good for the environment, when it really isn't.